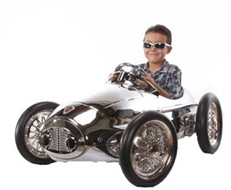 Although newly built, these limited edition Retro Racer children's pedal cars stem from the same classic inspiration as the Famous Ferrari F2 Racers and other Grand Pre Types of 1952-57..
A Beautiful made car and so well proportioned that most people are unaware of how big it actually is: A minimal amount of assembly is required..
Chrome wire wheels, steering wheel, windscreen, side exhaust and grill.Solid rubber tyresthat are much wider than some of the other cars,ensuring excellent useage on grass. With a padded seat, it's about a third bigger than the other cars. Some minor assembly is required. Built to a very high standard, and certain not to dissapoint!! Dimensions: Length: 49", Width: 26", Height: 19" Wheels: Steel Custom Spoked Design. 9.5" in diameter. 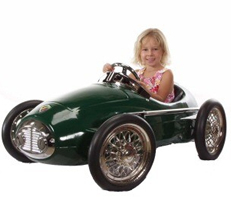 Car to suit ages 3 to 7 years old, for children with an average build. This model is very limited, and may be the most expensive in the range, but when you own one, you will understand why!! Finished throughout in solid beautiful chrome, and so highly polished, it is like a mirror!! 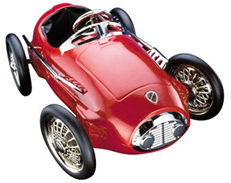 Inspired by the famous 1952-1957 Ferrari F2 Racers this car will turn heads wherever it goes. Finished to a very high standard. Car to suit ages 3 to 7 years. Chrome wire wheels, steering wheel, windscreen, side exhaust and grill. Built to a very high standard, and certain not to dissapoint!! Dimensions: Length: 49", Width: 26", Height: 19" Wheels: Steel Custom Spoked Design. 9.5" in diameter. Solid rubber wide tyres, so it will run very well on grass.